Moving to Huddersfield after granddads death in 1955 was refreshing a new start. Compared to Coventry's edge of city enviroment, Birchencliffe was paradise, we lived next to the cricket field surounded by green fields and open views. Just to see the change of landscape with woodland and local working farms, cows and sheep in the fields was truly amazing. Bearing in mind when you are 9 years old you do not travel far away from home so I was not aware that within miles Coventry was also surrounded in equally beautiful countryside. My Grandma ( Minnie) used to say when we were in the back garden " can you see the cows over Yonder" honest I was a teenager before I discovered Yonder was not in Birchencliffe. My Grandma welcomed having family around her having lost her husband Albert so early in life, however, it could only be short lived on a temporary basis as one could not expect Minnie to adapt her life to take a family of seven in her household. She was a fantastic cook, she would bake cakes, scones and make wonderful roast dinners that I had never tasted before. We had lots of Aunties and Uncles who welcomed us as we were a novelty, we had a slight Midland accent and they used words I had never heard before " wears ta barn" were are you going, "asta or right" are you OK, put thee cort on" Put your coat on. Just a 100yards from home we had a playground with a large slide, roundabout , an air raid shelter and a stream. I think the country life diverted the mischief in me as I had lots of things to do and discover, perhaps the worst thing I did was to steel milk from doorsteps other than that I do not recall being a bad boy. We had a problem with schools so I had to catch a trolley bus to Elland about 3 miles away. I attend South End School located oposite the Town Hall, however, I cannot remember much about it. 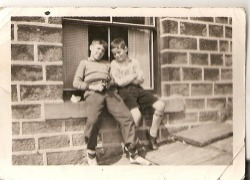 I made lots of friends in Birchencliffe and at school so I was settled and was very content with my life. 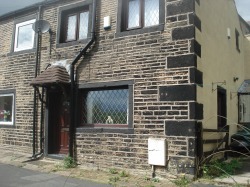 My father annouced we were moving to a place called Greetland maybe 8 miles away, a long way when you are 9 years old. Sadly we moved away from Grandma. 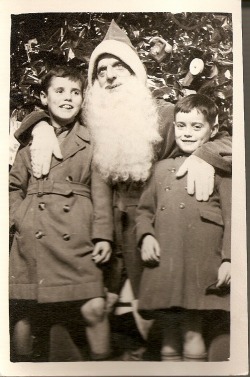 Note the Christmas photo I was wearing a Gabardine raincoat ( see the turn ups) given to me by a neighbour who's daughter had grown out of, it even had a fixed hood I used to hide it by tucking it in. The buttons fastened girl side, I hated seeing that girl if I had the coat on. Greetland is about 5 miles from Halifax it sits at the top of a steep hill heading towards the Pennines. A true old fashioned village in 1956, most people who lived in Greetland were born in Greetland, not many comers in. For a while, until end of term, I continued to go to Elland School and then moved to Greetland Primary School. This is a modern photograph of our house in Crosshills, a two bedroomed house with a small add on room above the kitchen yet open to the kitchen, like a small room stood on top of the larder storeroom. No bathroom we washed in the kitchen sink, had a bath once a week,in a tin bath hung up in the kitchen, we would share water and take turns as hot water came from a kettle. Yes all seven of us. On arrival the house had gas lighting as I remember lighting the mantles. The toilet, originally shared with neighbours was just accross the road. As you will see we had magnificent views accross the valley overlooking Bradley Hall Golf Club. Just like Birchencliffe we were never short of open ground to play on, just 200 yards away were open fields know as the mount. I started school soon after moving in at Greetland the 3rd year of junior school. I do not recall much about the 11 plus exams, maybe I missed them or at least missed the preparation, for sure I remember little about them. Must have taken them as I was bound for Greetland Secondary Modern rather than Elland Grammar School. I started to get interested in football basically playing with mates and also kicking a ball against a wall outside our house. A boy at school, Keith Beeby would bring me a copy of Charles Buchan's Football Monthly when his older brother had finished with it, this I would read inside out and became aware of the players and teams. Dennis Law, Huddersfield Town was my favourite. I would read about famous clubs like Manchester United, Spurs but I also took a liking to Wolves because I loved their amber and black strip and eventually bought the shirt. Reading about sport and nature, birds etc was the only thing that interested me and furthered my educational development. 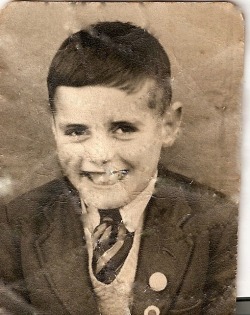 On my way to school in 1958 I met a friend named Victor Calvert, he was a good goalkeeper and Man City fan. As I greeted him I noticed he was crying and when I asked him why, he was surprised I did not know the news, " Manchester United have been in a plane crash and many players have been killed" he said tearfully. Victor could not tell me exactly who had suffered so I had to wait until returning home from school to get the news, from then on everyday had sad news, the good news was Bobby Charlton was OK and Victors favourite Harry Gregg was also a survivor. Man Utd became everyone's favourite in months to come. ( Above) Me and Jimmy Smith who later became a Rugby referee. Photo shows the wedding of my sister Christine to Barry Creese. 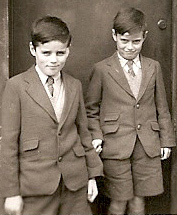 First time we had long trousers thanks to Burtons. Mum, Dad, Chris and Me. Just in Arthur Brearley, Mr Creese, David Brearley, Grandma Watson, Harold Brearley ( on doorstep Donald Creese and his wife next to Harold) Mable Brearley, Marion, Mark with Mrs Creese and Christine. Whilst living at Crosshills in the late 50's we had a pet budgerigar named Peter, he used to fly freely around the house as we would leave his cage open. 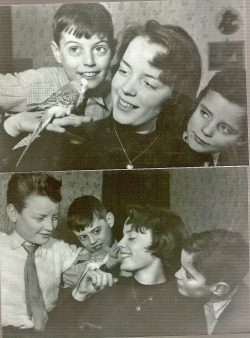 My Father was keen on pets we also had them around the house, in Coventry we had rabbits and a duck ( think we ate them at some time) yet Peter was our only house pet as Father had an allotment which included an avery of various birds. One day Peter flew into the open fire and lost most of his feathers and almost died, however, we nursed him, force fed him until he recovered. Somehow the Daily Mirror got hold of the story and paid us a visit. Circa 1958 they run an article in the Daily Mirror. The top photo was used in the article. The lower photo includes: David, Christopher, Christine and myself. My father must have had gypsy blood in him as he was always ready for a house move also maybe due to his temprement he would change jobs if he didn't get on with his bosses. So with regrets in 1960 we headed for a new home in Elland, 55, Beech Street. Brother Arthur has left Mortons the butcher and joined the RAF, Christine is married, living in Rochdale Road, Greetland, so Beech Street has two bedrooms, that means only 3 of us in one bedroom........so much space. The above photo's show the fantastic views we had from our house of Stainland Road and Bradley Hall Golf Club. On the right is our ex outdoor toilet shared by two houses and now overgrown with ivy, On the extreme right is a very steep cobbled walkway, I have included this to remind me how dangerous it was when we would sledge down it.